in purple dated 4 OCT 1909 on N.G.R. 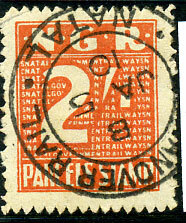 2/- orange PARCELS STAMP. (M.3.1) dated A/OC 28 09 on N.G.R. 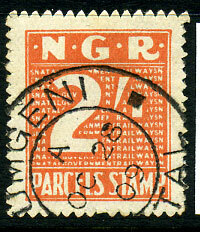 2/- PARCELS STAMP. (M.4.2) dated O/OC 15 09 on N.G.R. 1/- PARCELS STAMP, perf. faults. 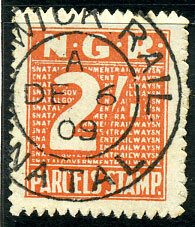 (M.3.1) dated DE 8 09 on N.G.R. 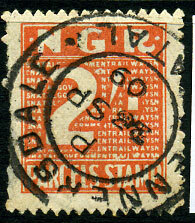 3d PARCELS STAMP, rare - no postmark recorded by Putzel. (M.2) dated B/JA 7 10 on N.G.R. 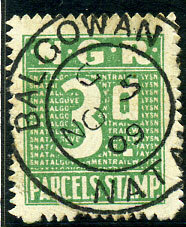 3d PARCELS STAMP. (M.2) dated B/JA 5 10 on N.G.R. 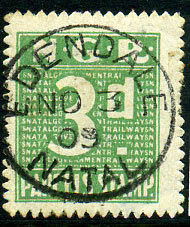 2/- PARCELS STAMP. (M.4.1) dated DE 14 09 on N.G.R. 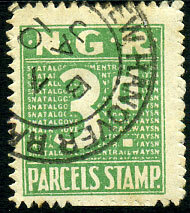 3d PARCELS STAMP. (M.4.1) dated A/23 NO 09 on N.G.R. 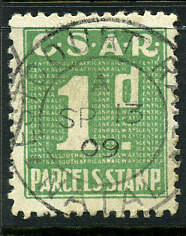 3d PARCELS STAMP. (M.3.2) dated A/OC 15 09 on N.G.R. 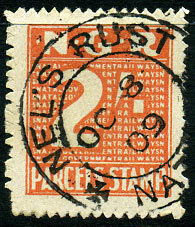 2/- PARCELS STAMP. (M.3.2) dated A/SP 30 09 on N.G.R. 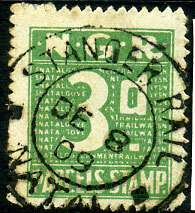 2/- PARCELS STAMP. (M.4.1) dated A/OC 5 09 on N.G.R. 1d PARCELS STAMP. 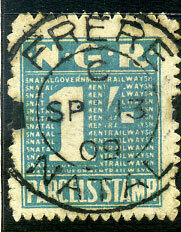 (M.2) dated P/23 SP 09 on N.G.R. 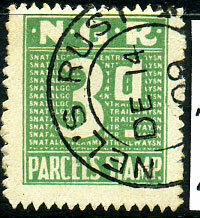 2/- PARCELS STAMP, perf. faults. (M.2) dated A/OC 5 09 on N.G.R. 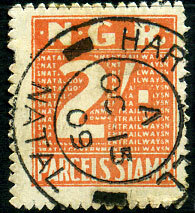 2/- PARCELS STAMP. (M.3.2) dated C/SP 13 09 on N.G.R. 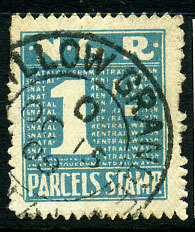 1/- PARCELS STAMP. (M.4.1) dated A/SP 13 09 on C.S.A.R. 1d PARCELS STAMP. 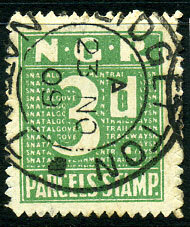 (N) dated NO 3 09 on N.G.R. 3d PARCELS STAMP., minor reverse tone spot. 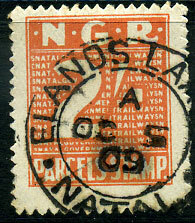 (M.1) dated C/NO 5 09 on N.G.R. 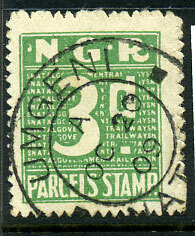 3d PARCELS STAMP. 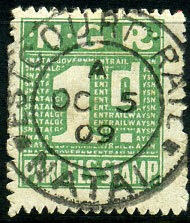 (M.1) dated A/DE 6 09 on N.G.R. 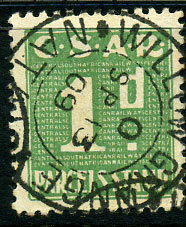 2/- PARCELS STAMP. (M.4.2) dated O/SP 13 09 on C.S.A.R. 1d PARCELS STAMP. (M.3.1) dated A/OC 20 09 on N.G.R. 3d PARCELS STAMP. (M.4.1) OC 8 09 on N.G.R. 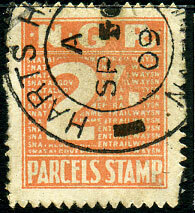 2/- Parcels Stamp.